I connect my Android phone to Ubuntu 13.10 through USB to access to its internal storage. 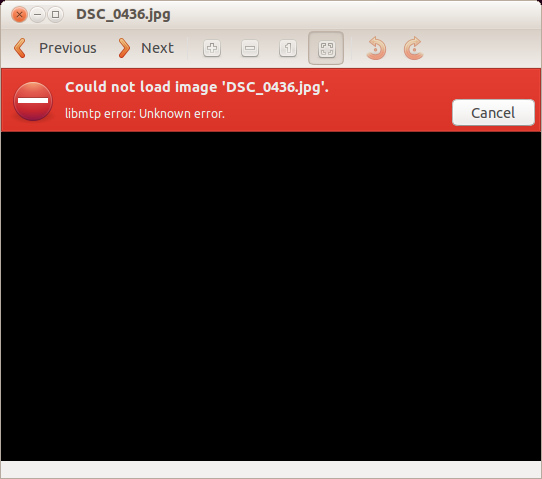 This error is shown no matter the application and type of file (eog for pictures, gedit for text). But when I copy and paste the same file to my PC, I can open it. The problem is still present in 14.04. Opening a document results in a "libmtp error: Unknown error", whether it's a picture in EOG or a text file in GEdit. Opening a video with Totem results in a "Could not determine type of stream" error. FIle operations are fine though.